If you’re thinking of buying, selling or remodeling a home in Central Florida, you’ve come to the right place! 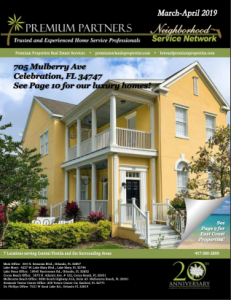 Premium Properties Real Estate Services provides all the tools you need as Central Florida’s only Full Service, Independent Real Estate Services Provider. If you’re thinking of selling Real Estate in the Central Florida area, Premium Properties Real Estate Services provides all the tools you need to be the best in the business at a fraction of the cost of other companies. Buying a home, especially your first home, can be a trying experience. Let the expert Realtors of Premium Properties put you on the right track towards getting your new home. The trusted, experienced, professional Realtor agents at Premium Properties Real Estate Services will help close the sale of your home as quickly as possible. Whether you’re looking for a temporary place to live in Central Florida, a new place to call home, or a second home by the beach, Premium Properties has you covered. Download our app and search the most accurate listings both in Central Florida and on the Coast in one place for FREE! In business since 1999, Premium Properties Real Estate Services is the number one Independent Real Estate company in the Central Florida area. Here are some of our most common questions we get from clients and potential clients. We are your resource for home buying, selling, financing and real estate listings in Orlando, Waterford Lakes, Winter Springs, Winter Park, Oviedo, Lake Mary, Lake Nona, Sanford, Mount Dora, Altamonte Springs, Casselberry, Maitland, Clermont, Deltona, Orange City, Debary, Deland, Enterprise, Osteen, Cocoa Beach and all of Orange, Seminole, Lake, Osceola and Brevard County. What types of property do you handle? We are ready to assist you whether it’s a home, condo, foreclosures, rental, commercial realty, or any other type of property that you may be searching for. Our Central Florida real estate offices are strategically located in the best areas to serve you including Dr. Phillips, Lake Mary, Sanford, Downtown Orlando and Lake Nona. We also have satellite offices located in Cocoa Beach and Melbourne Beach, so we can help you with beach properties as well! Do you offer discounts for military or other professions? Yes, we offer a 15% commission rebate after closing for our Florida Heroes! A Florida Hero is anyone employed in the medical industry, a teacher, active duty or veteran military personnel, policeman, or fireman or paramedic, that is currently employed or moving to Central Florida. Click here to learn more about this program and register! What does it mean to be Full Service? Our full-service approach includes in-house mortgage companies, title company, property management division, a networking program of home service providers and more. We are your one stop shop whether you’re moving to Orlando for the first time, or are a lifelong resident. Always able to get the information that I need and the team there is always friendly. RONNIE Y. Our Realtor, Bryant Day was great. He was very patient with us while we tried to figure out what we wanted and changed our minds during the process. He was always available and quick to make appointments and show us properties. We LOVE our home, and have recommended Bryant more than once! JULIE S.
Always had a good list of homes to see. Quick, efficient, and great to work with. If the home wasn’t good when we walked in we turned around and found a good home on the list. STEVEN M.
Find a listing you like and one of our agents will be in contact with you shortly. ©2019 Premium Properties Real Estate Services. John S. Huebner Licensed Florida Real Estate Broker. All information deemed to be reliable, however not guaranteed.